Francesco de Bernadone, known to us as Francis of Assisi offers a model of Gospel living that has transcended time. Some have said that his example is second only to Jesus: the master teacher. Renouncing a life of privilege and wealth for a life of poverty and humility among the lepers and the impoverished he served, he lived the good news in a way that was radical both then and still today. His spirituality not only revolutionized the medieval milieu in which he lived, but also gave birth to a Franciscan spirituality that is as profound and life-giving today as it was in the thirteenth century. 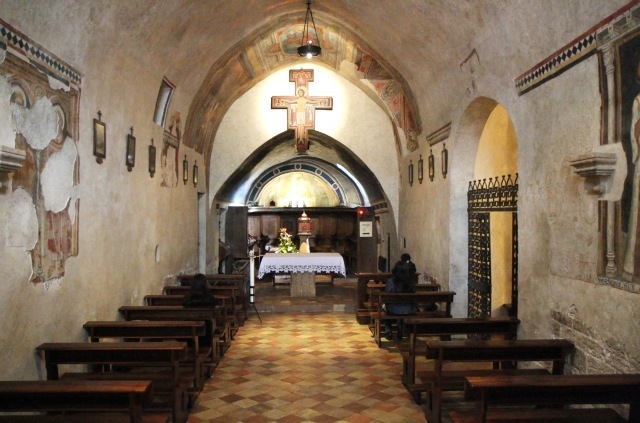 The story goes that sometime in 1206 Francesco was praying before the altar of the then-falling-down San Damiano. As Francesco looked at the crucifix before the altar, it seemed to speak to him and said something to the effect of, “Francesco, my Church, as you can see, is falling down. It needs to be rebuilt.” Francesco, at first taking this message literally, immediately set out with great passion to rebuild San Damiano. This led to his selling some of his father’s very expensive cloth, and the famous confrontation in front of the town and the Bishop of Assisi in which Francesco stripped naked and handed his clothing back to his father, telling him he was returning everything his father had given him, as now he had only “his Father in Heaven.” Thus Francesco renounced his large inheritance and embarked on his career as a follower of Jesus of Nazareth. 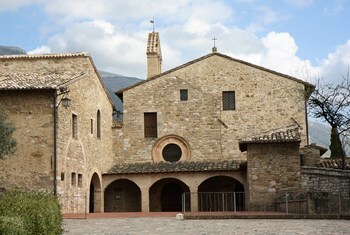 Francis accepted the call he heard in the church of San Damiano in the most literal sense, and began repairing what had fallen into dire disrepair. In time, Francis came to understand this calling as not merely about physical church buildings, but the sorry state that the body of believers had become in his time. It emerged as a more universal call—one that would prompt him to flee the trappings and opportunities of his wealthy upbringing, to seek spiritual guidance in the mountainous terrain high above Assisi. Francis underwent a spiritual conversion that ultimately never ended. In fact, the notion of ongoing conversion is at the very core of Franciscan spirituality. This word inspired him to devote himself to poverty, simplicity and humility. Clad in a rough garment, barefoot, and according to the gospel word, without staff or legal tender, he began to preach, without a church license, the Gospel message. Within a year he had eleven followers. Francis chose never to be ordained a priest and so the community that gathered around him lived as “lesser brothers,” with a statue less than that of fully ordained priests. Together, with Francis, the brothers embraced a life of poverty wandering through the mountain districts of Umbria, cheerfully serving the poor and the lepers and making a deep impression on those that encountered them by their earnestness. During his day one had to be licensed by the Church, or recognized. In the era before his birth others groups had emerged within the Church, what we might call renewal movements or the early hints of reformation. The Cathars (from the Greek word for pure, “katharoi”) spread their influence from the Balkans to upper Italy and southern France. The Waldensians emerged from an ascetical lay brotherhood gathered around a rich merchant (Peter Waldo) from Lyons, France. Both groups emphasized ascetism, or a life not devoted to pleasure and comfort, the rejection of war and oath-taking as well as of altars, church buildings and relics. They also strongly endorsed lay preaching – even by women! The answer of the official church was that these two groups were condemned as heretics and lay preaching was banned in the 12th century, and such opposition was persecuted without mercy in the Church. These movements paved the way for what would be called the Inquisition: the systematic legal persecution of heretics by a church court. Centered in the town of Porziuncola, they preached on the streets and had no possessions, going through Umbria before expanding the scope of their mission to all of Italy. Francis, and his brothers, went where no one else would go, bringing the healing message of God’s love to all. Francis treated the impoverished and the marginalized with compassion and dignity, seeing the face of God in all whom he met. Likewise, he treated all of God’s creation with reverence and care, seeing in all things the reflection of God’s divine love. They did this in a time in which the church was in need of great reform (a truth recognized even by the pope!) as she had become outwardly powerful, but inwardly weak. Francis helped to re-build the church by models that true worship is not just adoration of Christ, but an authentic conformity to his life and suffering, and imitation of his gospel living. The passage in Matthew 10 is Jesus sending out his disciples. While this is one episode in Matthew’s gospel it becomes two separate ones in both Mark and Luke (the Sending of the Twelve, and the Sending of the Seventy). The text insists upon the way in which the disciples are gathered around Jesus, who then gives them power to heal and authority to chase off demons, before he sends them out. It is in this episode that the disciples go from having been called by Jesus , and accompanying him, to participating in his work, being sent to proclaim the good news of the Reign of God. They are sent out in poverty to emphasize the divine authority with which they are entrusted. The good works that emerge are not from their own power, but from a greater Power who they announce and proclaim. But they’re to do so without seeking comfort and wealth (moving from one house to a better one) and to do so without forcing conversion. The Pharisees in that day were said to shake off the dust collected on their sandals as they returned from travels into foreign Gentile lands, back into the promised land of Israel. It was a symbolic recognition of difference. It seems to me to be an action more of separation a, recognition of responsibility – that they have made their choice in giving or withholding hospitality. It’s less a testimony against them, than it is a testimony about them. The last phrase in verse 16 highlights shrewd leadership, not necessarily what we commonly associate with Christ-like living. And yet in the life of Francis we see how he understood that he was sent as a sheep among wolves. The questions that this gospel text and Francis story ask us are about the state of the Church today, and our call to (re)build it in the 21st century. Many are the voices looking for God, the Divine or “spirituality”, but rarely do they come to and into the church in their search. Is that because of the Church, or because of our culture? Often suspicion is felt that church membership is primarily about getting money to fund the church and getting new volunteers to be on committees and to make things happen. Numerous urban churches (all churches in fact) are facing deteriorating buildings cared for by declining congregations. 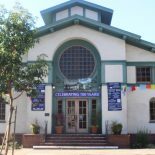 Is the Church primarily a building? Can we be the Church without a building? How do we be the Church today in 2014? We also are asked how we will respond to our call and sending into the world to proclaim the Kingdom or Reign of God. How do we go forth, or do we? Do we do so in poverty or wealth? Do we so in our own power or in recognizing a higher power? The Gospel always sends us out, afar, to do something new. Look at the stories of the Bible, starting with Abraham and Sarah, to Paul of Tarsus. Faith and spirituality is not a static or stagnant state, but a dynamic movement forward, a lurching and lunging towards life, vibrant existence and contagious freedom. *What word, phrase or image strikes you in the Luke passage? *How does the story of Francis’ call and vision touch your story, our story as a church? *How do you see the Church as being in need of being rebuilt? *How do you see yourself as being sent to proclaim the Kingdom of God come among us? This entry was posted on January 23, 2014 by Monte McClain in Uncategorized and tagged Blogging Towards Sunday.